A group of anonymous protesters in Guy Fawkes masks just politely rang the doorbell at NCJ HQ and handed us a flier that enumerates the ways our government is trampling on our constitutional rights, and damned if it wasn't the highlight of our day. 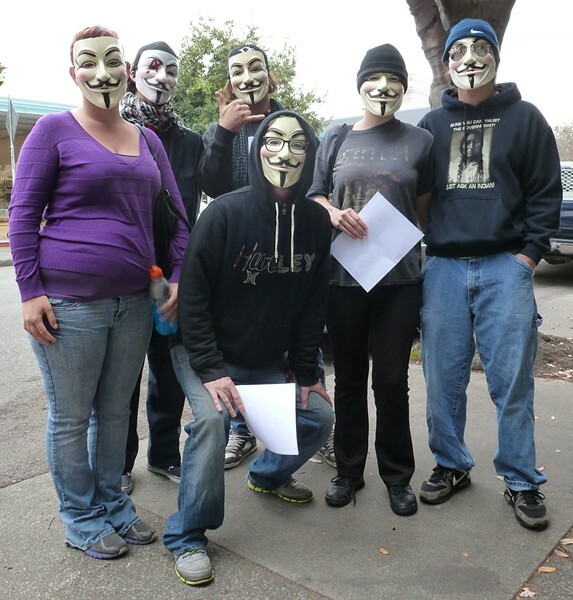 "We’re not trying to be intimidating with the masks," explained Zeppelin-shirt Fawkes. "The point behind the Anonymous masks is we’re not standing for ourselves; we stand for America, for everyone." The protesters helped us remember (remember?) that it's the 5th of November, day of the Million Mask March! Our president "has forced obamacare [sic] into act, and not listened to any of Americas' [sic] outcries on our disapproval. "The Government has continuously attempted to take away the rights of americans [sic] to own firearms, to protect their families and homes, as well as provide food with their firearms." President Obama is requesting a third term in office and the flier writer(s) would like to know how he's justifying that request. We're convinced. Tell Obama to heed outcries on our disapproval, allow us to provide food with our firearms and justify his (heretofore under-reported) request for a third term. Now where can we get our masks?